Snow covered Brookside Drive, and the rest of the Swanton area, on Saturday. 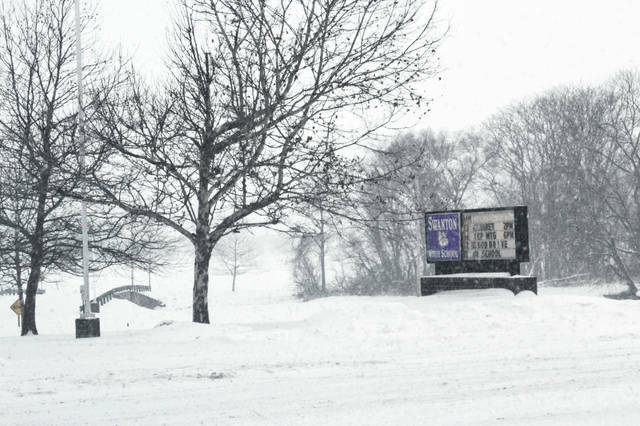 Snow falls at the Main Street entrance to Swanton High School on Saturday. The first major winter storm of the season hit the Swanton area over the weekend, leaving as much as 10 inches of snow in its wake. It was quickly followed by a shot of cold, arctic air. A Winter Storm Watch was issued by the National Weather Service on Thursday afternoon. It called for the possibility of 5-8 inches of snow and the storm met or exceeded that. It was evetually upgraded to a Winter Storm Warning. 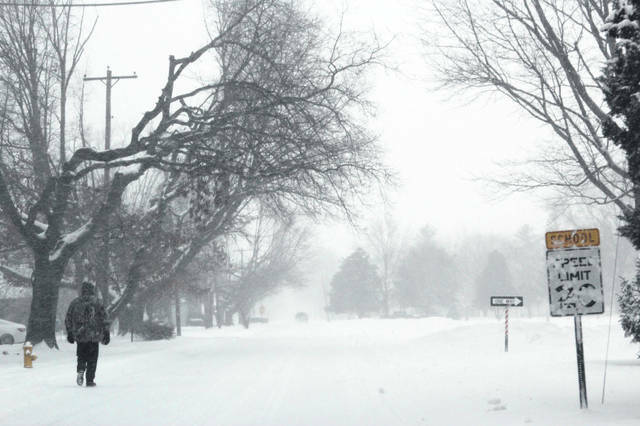 The National Weather Service reported 10 inches of snow in Wauseon. There was also a report of 7 inches of snow in Swanton and an official total of just under 6 inches for Toledo Express Airport. Fulton and Lucas counties had an extended period under a Level 1 Snow Emergency Saturday and went to a Level 2 Snow Emergency late in the day. Travel was hazardous, especially on back roads that were covered not only by falling snow, but blowing and drifting snow as well. The level went back to 1 on Sunday morning. Following the snow, the temperature dropped to near zero early Sunday morning with a wind chill in the teens below zero. The high Sunday barely reached the teens and, under clear skies, quickly dropped back near zero in the evening. A Wind Chill Advisory was in effect from Sunday at 6 p.m. to Monday at noon. Wind chills as low as 15-25 below zero were expected. Wind chills of that level could cause frostbite on exposed skin in as little as 30 minutes.